Blood vessels are a then layer of squamous epithelium, also called endothelium, which keeps your blood cells inside the blood vessels. Endothelium, also keeps blood clots from forming. The endothelium lines the body’s entire circulatory system, extending form the heart’s interior, called the endocardium. There are three primary types of blood vessels: Veins, Arteries and Capillaries. Blood vessels names are based on the region of the body they carry blood through or based on nearby organs and structures. For example the brachiocephalic artery will carry blood from the heart to your arm or brachial and head or cephalic region. There are multiple branches of arteries, one is the subclavian artery, which goes under the clavicle. Once the artery runs through the axillary region of the body, it becomes the axillary artery. 1. Veins and Venules, Veins have a diverse array of functions, they are large vessels that return blood to the counterpacks of your arteries. This is basically because arteries, arterioles, as well as capillaries will absorb most of the force of your heart movements or contractions. veins and venules will have very low blood pressure. Without this pressure, your veins grow much thinner, smaller, elastic, and with less muscle than the wall of your arteries. To help push back blood to your heart, veins will rely on gravity and inertia. The force the bodies skeletal muscle contractions also help push blood back to the heart. Some may only have one way blood valves to prevent blood from flowing away from the heart. Within the skeletal muscle, the body will contract and squeeze a vein to push blood to the valves in and around the heart. As the skeletal muscle relaxes, the valve is tight enough to trap blood until there is another contraction to push blood closer to the heart. Venules work in a simlar function to arterioles, because they are quite small vessels that connect capillaries however venules connect to veins, and not arteries. Venules will pick up blood from the capillaries and move them to larger veins to transport back to the heart. Arteries and arterioles: Arteries are basic blood vessel that carries blood from your heart to the rest of your body. Arteries carry blood that is highly oxygenated, as it leaves the lungs to the rest of the body’s tissues and cells. There is an exception to this function, which is the pulmonary truck and arteries carry de-oxygenated blood form the heart to the lungs to receive oxygen. Arteries have high levels of blood, putting pressure against the body’s arteries’ walls, during the process of blood being pushed from the heart contractions of the heart. These thicker walls are more elastic and muscular than those of other vessels. 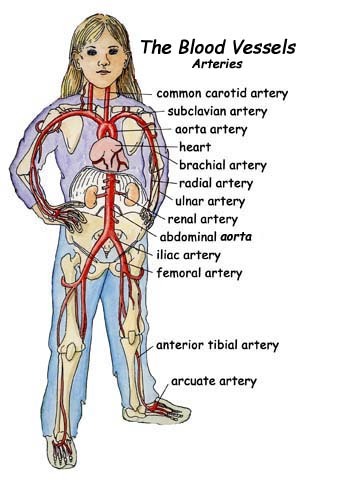 The largest arteries in the body contain very high percentage of tissue that is elastic. This allows them to stretch under the pressure from the heart. Smaller arteries also have more muscular structure along their walls. These muscles are very smooth to allow for regulated blood flow through its lumen. These arteries also expand and contract. This is the way the body controls how much blood flows to different parts of the body depending on the circumstance. These regulations affect blood pressure, thus lowering and increasing as the body needs with the arterial walls contractions. The arterioles are very narrow arteries that branch form the end tips of the arteries to then carry blood to capillaries. Being further from the heart, arterioles have a significantly lower blood pressure than arteries because there are more of them, and have a lower volume of blood flowing through them. The arteriole walls are thin as well, yet smooth to control muscles for blood regulation of pressure and flow. 3. Capillaries are the smallest and thinnest blood vessels inside the body, yet they are the most common. They can be found in every tissue within the body and running along the borders and edges of the avascular tissue. Capillaries are what connects the venules to the arterioles. Capillaries will carry blood very close to cells so that tissues can exchange nutri ents, gases and waste product. There is a thin layer of endothelium that makes up the capillaries wall. This allows for the smallest amount of structure between the body’s tissue and blood. The endothelium is filter for blood cells inside the vessel as well. This allows it to diffuse chemicals, liquid and dissolved gas and the concentration gradients into and from the body’s tissue. Precapillary sphincters are smooth muscle bands that are at the end of capillaries ‘arteriole. The sphincters will regulate flow into capillaries. Since blood is limited throughout the body, not every tissue will have the same oxygen and energy requirements. The precapillary sphincter will reduce blood flow to tissues that are inactive so that active tissues can receive more blood.